The Shiva Lingam stone is a sacred stone of both the ancient and modern worlds. They are found in the Narmada River in Onkar Mandhata, one of the seven holy sites of India (also called Shiva Lingams). The Narmada River is located in the central western region of India. This is are a variety of cryptocrystalline quartz that is oval in shape and contains earthy hues, usually two-toned. In ancient Sanskrit, Shiva Lingam means a sign or symbol. Accessible only during the dry seasons, these stones are collected from the river bed by only a few families who have been trained in the way to identify only the most special pieces. The stones are hand polished and sometimes sealed with a mixture of waxes and oils, according to formulas handed down from generation to generation within each family. Man has collected stones since the beginning of time, and assumed that certain ones were containers of the life force with all its mystery. The Shiva Lingam is such a stone. It has been highly venerated and used extensively throughout history for both worship and ritual. 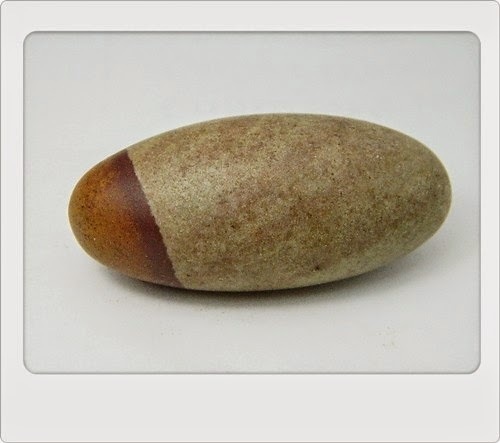 These egg-shaped Shiva Lingams are a good choice for anyone seeking balance and harmony in his/her life, and may also be useful for those engaged in the study of Ayurvedic practices. Shiva Lingams are said to have a supreme ability to hold vibrational force and power. The density of the Shiva Lingam is close to emerald. The red markings you see on the stones are the meteorite material and are considered spiritually auspicious. Properties for Stone: Narmada Shiva Lingam. Issues and Ailments (Spiritual): Appreciation, Consciousness, Creativity, Dreams, Energy, Healing All Levels, Higher Realms, Higher Self/Consciousness, Humility, Intuition, Karma, Meditation, Serenity, Spiritual, Surrender Ego.